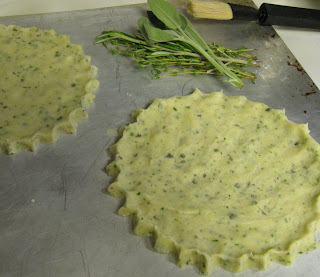 Preheat oven to 375˚ F. Stir together flour, 1/4 cup sugar, salt, and chopped herbs in a bowl. Add butter and stir with a fork until mixture forms a dough (I mixed the ingredients in a food processor instead). Divide dough in half and pat each half into a 6 1/2 to 7-inch round on an ungreased baking sheet. Crimp edges of rounds and cut each into 8 wedges with a sharp knife. 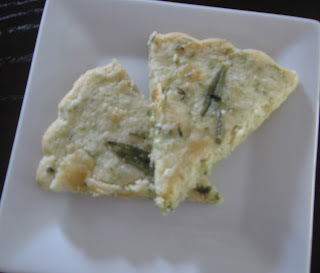 Lightly brush with egg white and arrange 1 leaf of each herb on each wedge. Brush herbs lightly with egg white and sprinkle with 1/2 tablespoon sugar. Prick each wedge with a fork. Bake until golden, 15 to 17 minutes. Recut wedges while shortbread is hot, then cool completely on sheet on a rack. Cookies will keep in an airtight container for five days. *You can opt for only two herbs, if you prefer. Yum! Gourmet, the September 2005 issue.